Few days back, I bought a bicycle to commute to my office. Being a tech addict we always try to make our normal environment into a tech filled environment. Likewise I searched for few tech stuffs on the internet to transform my normal bicycle into a tech-cycle. My first search was for a bicycle mount for my 5.3 inch smartphone. 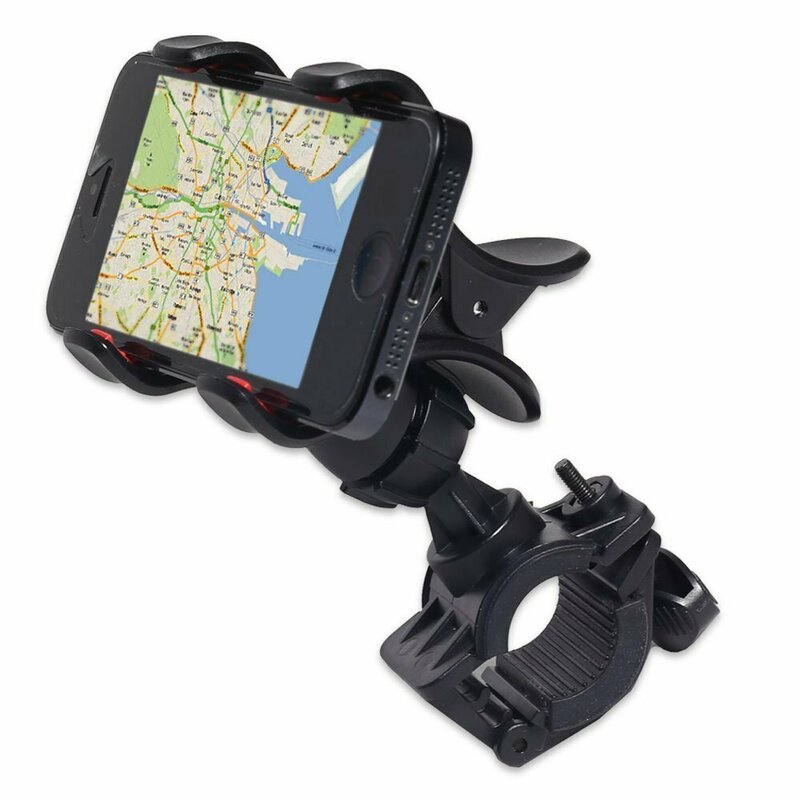 Actually I got one for me, If you need a best smartphone mount for you, find the best one from below listed smartphone mounts. Finn. The universal smartphone mount for every bike. With Finn you can safely and easily mount your smartphone to any handlebar. Thanks to its simple design and high quality silicone material, the mount withstands whatever you throw at it. Buy Finn from the official website. They are shipping the product all over the world. 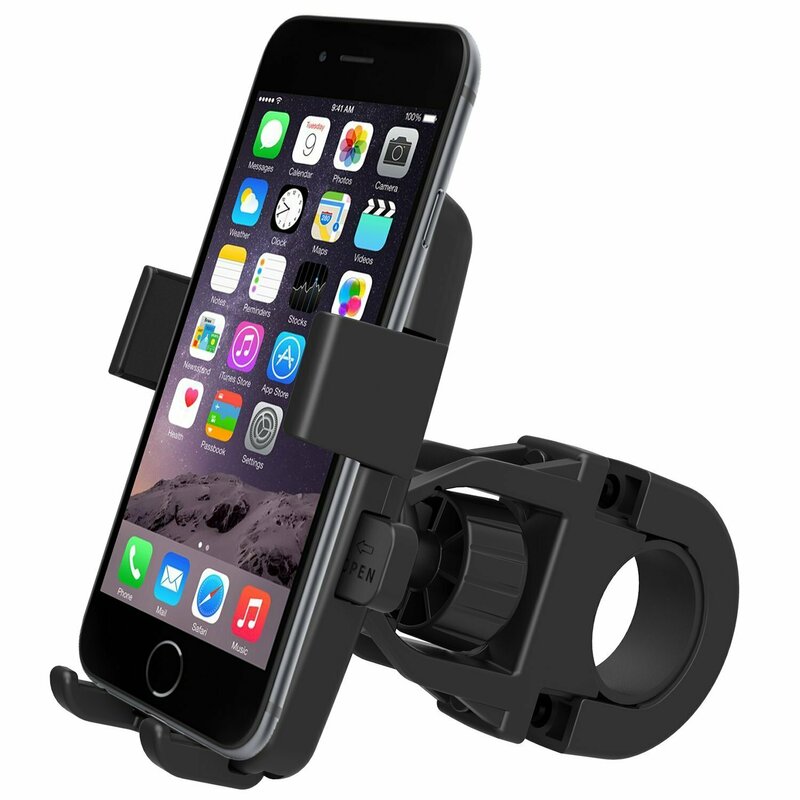 iKross Universal Bike Mount Holder is designed to safely and securely hold your smartphones, MP3 players and GPS devices on bicycle bars. It features a fully rotatable ball head joint that twists and turns 360 degrees so you can easily adjust your device for optimal viewing angles. It’s lightweight, durable, high temperature resistant, and perfect for everyday use. GreatShield Universal Bicycle Handblebar Mount is amazingly designed to install easily and quickly on any bicycle bar and is a great tool that works with any smartphone or navigation devices up to 89mm / 3.5 inches wide. The mount has a fully rotatable holster that twists and turns 360 degrees so you can view your device horizontally or vertically. No more looking for or holding your device when navigating traffic! Keep your hands on the Bars and eyes on the Road when riding with this German engineered iGRIP Motorcycle/Bicycle kit. Your cellular phone, GPS, or iPod will be securely positioned in an upright and easy to view position while riding. 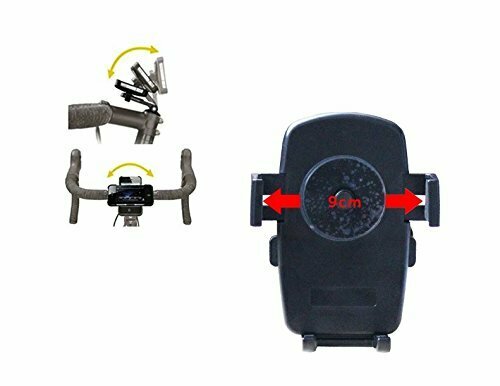 This combination cradle with sturdy handlebar mount attaches to any motorcycle, bicycle or scooter standard handlebar up to 3.175 cm in diameter (1 1/4 inch), and is the right choice for if you have ANY cellular phone or MP3 player. This universal cradle keeps your phone in a secure and upright position and provides a Handsfree option that can easily be removed and stored when not in use. Be safe – be Handsfree – with HR Grip! Koomus BikeGo super tight ‘Safety is all that matters’ bike mount does the job simply as it sounds. It holds any smartphones, iPods or GPS devices very securely and extra secure safety pin prevents device to fall even if bike is fallen. You can mount your smartphone with or without case on it and Super tight Grip will always secure your device while you ride. It is also fully adjustable with 360 degree rotation for quick portrait and landscape view. 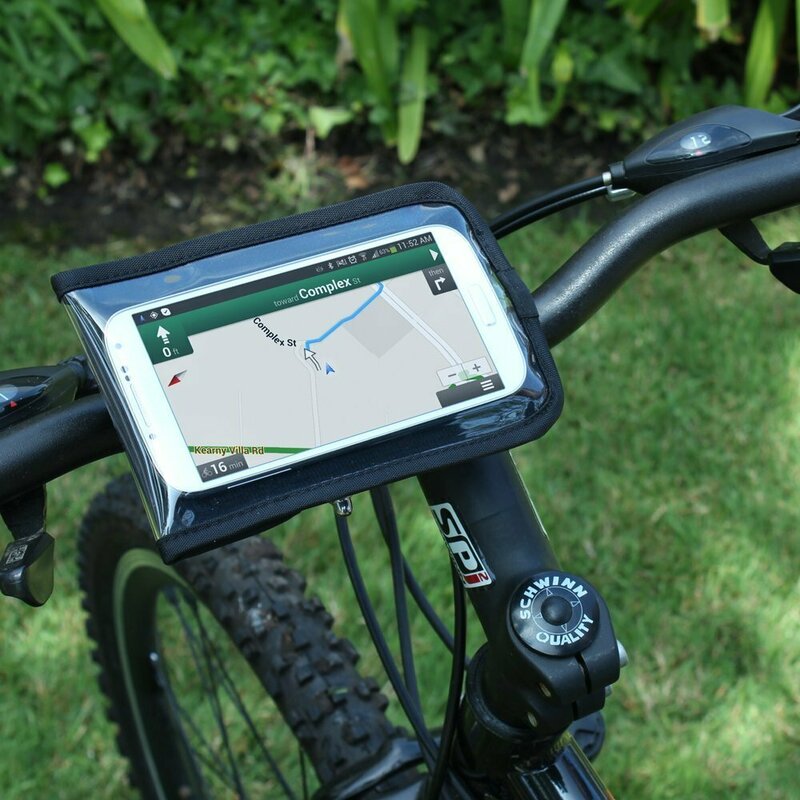 Koomus Bikego Bike mount, a smart way to mount for a ride. 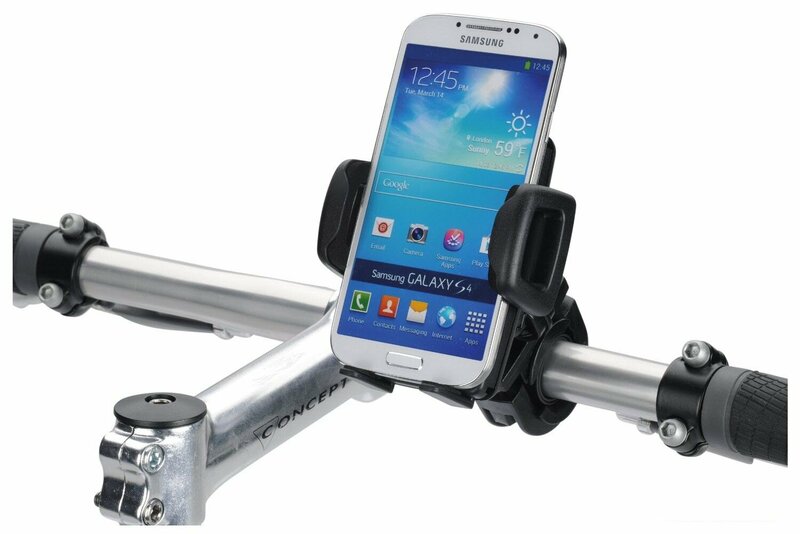 The Satechi RideMate is a safe and secure smartphone mount for bicycles. The water-resistant neoprene pouch attaches to a 360-degree rotating connector which snaps into position once the ideal screen orientation is achieved. 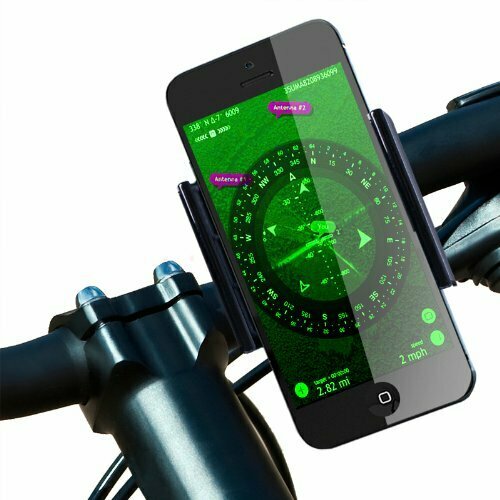 When attached onto a bicycle handlebar, access to your smartphone becomes easy and safe due to the touch-sensitive clear front panel. Headphone cables can be threaded through a hole at the bottom of the case or through the top of the case. The mount fits bicycle handlebars 0.79″ – 1.43″ in diameter and the pouch fits smartphones up to 6.3″ x 3.5″. Installs easily and quickly on any bicycle or motorcycle bar up to 1 1/4″. With just one simple hand motion, the device is quickly mounted or released. 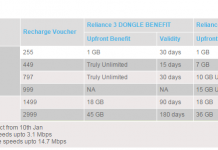 An additional security band gives you even more peace of mind. Compatible with smartphones, cameras or GPS devices from 2 inches up to 3.5 inches wide.